Google Maps has a new feature that lets you fix inaccurate addresses for local businesses, even if you're not the owner. You just have to click on "edit" in the info window and choose a new location. 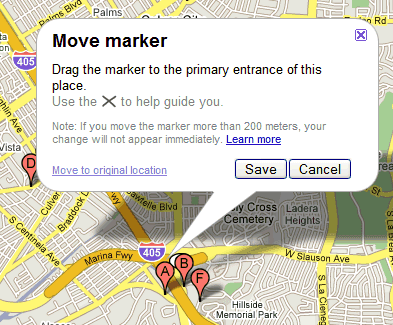 If you move the marker more than 200 meters away, the change will need to be reviewed before going live. There's also a history of previous changes and an option to go back to the original location. "You might be worried about people monkeying with markers. Fear not, we've thought of that. Whenever you find a recently-moved address or business, you'll see a "Show original" link you can click to see where the marker was originally. If it's in the wrong place, just move it to the right one," explains Google LatLong Blog. This also works for locations of addresses and landmarks, but only in the US, Australia and New Zealand. More about the new feature here. When I try to do this I get an error "Because of technical restrictions, you cannot edit this location at this time." I get the same thing, Jason. Funny. I don't use maps a lot, once a week or so. But just today I was looking for the nearest Radio Shack and found one almost walking distance, and in a residential area. I finally realized that the address consisted only of a zip-code, and the wrong one at that. I posted a "review" of the shop stating that it was in the wrong location. I wish I'd known about this (or maybe it wasn't available yet). Great idea though. Wherever there is a centroid of a zip-code you will find a cluster of businesses there even if (as in my case) that happens to be the middle of a bay. Will be nice to see those finally start to get fixed up. Jason, I also got the same error at an old address of mine. That town used coordinate-style address i.e. NXX WYYYY Foo st. Is your similar? After a few days it started working for me. I still haven't seen this feature - being in the UK maybe this has an effect. Any ideas how I can enable it or just get it working? How can I edit the address details? I am an owner of a bed & breakkfast and Google Maps points to an incorrect location for my business. Using the Edit feature, I 'claimed' my business and this allowed me to reposition the Google Maps marker. I did this back in Aug 2008 and I was certain that it worked. Recently, I discovered that Google Maps is again pointing to the original 'wrong' location for my business. But when I Edit my business, the marker points to the correct location. Does anyone know of what would cause this? I think Google has made a number of serious blunders. a competitor posted a photo of a HORRIBLE house as our business address. And as this rather silly article indicates even after I correct it. The BARN will still show after corrected. I am calling my lawyer. i'm not sure what that all means - other than the fact that folks can't get to where they're trying to get to. There is a business that closed several months ago in Redmond Wa that shows on Google Local searches...how can I help them get it out of there. 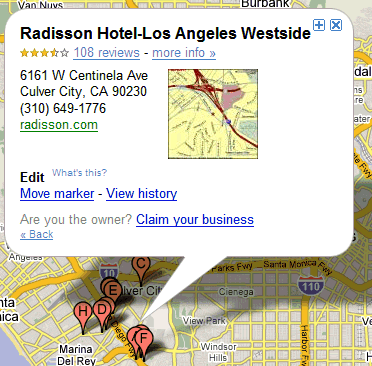 If that business didn't register at Google Local Business Center, find it using Google Maps, click on "More info", then click on "Edit" and select "Remove place". I just want to tell Google when a road changes so they can fix their map - I can't get accurate mileage/directions because it doesn't know the road changed. I'M STARTING UP A HOME BASED BUSSINESS(LLC. )THAT REQUIRES MY ADDRESS. I DO NOT WANT MY HOME SHOWING UP ON GOOGLE. IS THIS POSSIBLE? well, Google had my apartment building on the wrong side of the street (evens instead of odds) and it's a LARGE complex. then the locale of a Vocelli pizza was off by more than a mile! Correct location is 5505 leesburg pike, but Google put it at like the 7400 block of the pike. This isn't just a bit off, it's WAY off!!!!! This may be irrelevant to this particular topic, but I have noticed that google maps have made some strange modifications to state routes. For example, I live in Massachusetts so obviously I look at google maps to get from place-to-place, and when the place that I am trying to get to is on a state route such as "Route 3A" for example, it now says "Massachusetts Route 3A" instead, not showing the actual logo like interstate highway routes, so therefore "blocking" the actual street names. I hope google notices sometime soon so they can fix the modification, and I hope the best of luck to all of you getting the answers, or "corrections", to your problems. Is there a way to edit a Canadian address? I have tried to edit an address and I can't. The Town of Olds site is wrong the address that comes up when googled is the Olds Municipal Library and phone number. Please help us fix this!!! The Laurels Dumfries is listed wrongly as Ballinlochan Terrace?? The Google Maps problem you reported has been reviewed. We're currently unable to address issues of this type. We will keep your report and hope to do more to improve our map data in future. Your report: This at-grade intersection was replaced with ramps and a flyover in late 2009. Note that this means that south-bound 28 to Frying Pan Rd is now a right exit, not a left turn at a traffic light, which impacts driving instructions on a 6 lane road! I don't even get the option to edit places. I wish I did because there are a lot of typographical mistakes in my area, as well as several businesses that no longer are in the space indicated. i added a place in google map and realize there are some mistake. I couldn't edit the detail anymore. What should I do? I edit the business location marker but somehow it need a verification. Who will verify my edit? that business listing is mine. I found a comment that said "please state the reason of edit". I dont know where to reply this comment, I also dont know how to confirm the edit. What a complicated process of businness listing..Somebody please help me in a simple way..This thing gonna make me tired.. I moved my business and the new address has been updated. Unfortunately the pin had not moved and when I move it manually, I only get an approximate address. this is aproblem because not only is it approximate, it's wrong (257 instead of 265). I know this is going to cause problems and I don't want to publish it like this, but I do want a google map. can someone please make a suggestion. I put the link under my name (Jason). My parents home comes up at the wrong location. It now concerns me because the location that does come up is in a different fire district. It came to my attention when they recently received a home owners insurance statement with a large cost increase. When asked why , they said the increase was due to being in this other fire district. I'm now thinking that if my parents ever need emergency service, the service will go to the wrong address. Not cool at all! How can this be fixed? I moved my business to another location...how do I change the map in Google Maps? it would be nice if google would fix their current products rather than playing with new products...like the Google+. We've already got facebook, lets work on the things that we actually use on google. Indeed people are monkeying with a marker I placed on the map for a friend's business. And not just any people, but google map editors. I put the marker on the right place. After a few days someone would put it in the wrong place. It's a never ending tug of war. Once a business is verified, google should allow the business owner (or their agent) to lock the location marker so nobody else can move it.